The stage is now set for the controversial three-day cultural event opening tomorrow on the Yamuna flood plains even as Art of Living guru Sri Sri Ravi Shankar struck a defiant note that he will not pay Rs 5 crore fine imposed by Green Tribunal and would rather go to jail. The stage is now set for the controversial three-day cultural event opening on Friday on the Yamuna flood plains even as Art of Living guru Sri Sri Ravi Shankar struck a defiant note that he will not pay Rs 5 crore fine imposed by Green Tribunal and would rather go to jail. Environmental activist Manoj Mishra, who has petitioned the National Green Tribunal (NGT) for a ban on the event, today again approached it complaining that AOL has not taken permissions from agencies like police, fire and CPWD and that the Ravi Shankar has said he would not pay the fine. The NGT bench, headed by chairperson Swatanter Kumar, said that AOL has time to pay the fine till tomorrow and law will take its course if it fails to do so. 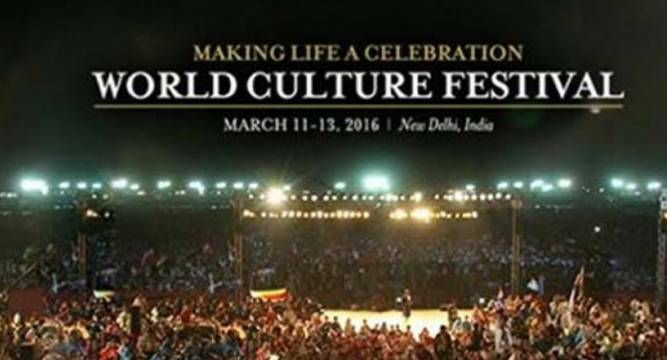 Prime Minister Narendra Modi is scheduled to inaugurate the ‘World Culture Festival’ that plans to bring together people of talent, eminence and repute in which 3.5 million people are expected to participate. In the wake of controversies triggered by concerns over environmental violations, President Pranab Mukherjee pulled out of the valedictory function on Saturday and there was no official word on whether Modi will participate. Zimbabwe President Robert Mugabe, who was one of the invitees, has also pulled out of the event. Yesterday, the NGT expressed helplessness in banning the event after activists petitioned the tribunal seeking a prohibition of the event on the ground that there was large scale violations of environmental norms on account of the event. However, it imposed a fine of Rs 5 crore on AOL as environmental compensation and asked the organisation to deposit the amount with the Delhi Development Authority today. It found several environmental violations by the organisers of the event.